-L-shaped bench cockpit seating with teak table. Very well kept boat. Launched new in 2005. Has been used as private only till 2016. Late 2016 purchased by the present owners for charter use in Greece. 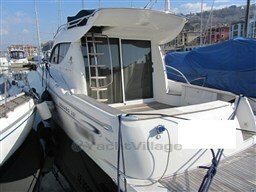 generator, electronics, hydraulic gangway, electrics, upholsteries….). Recently they decided to sell the boat, because they are interested in a bigger boat. The boat is lying in Greece since new. Guten Tag, Ich habe auf YachtVillage Ihr Angebot gesehen für Nimbus 320 Coupe - 2002 (code: 284786). Ich interessiere mich für das Angebot und möchte Sie bitten, mich zu kontaktieren. Vielen Dank.